This is a guest post from Zoë Condliffe, founder & CEO of She’s A Crowd which is a social movement that uses crowdsourcing technology and storytelling to close the data gap in sexual assault and gender-based violence. 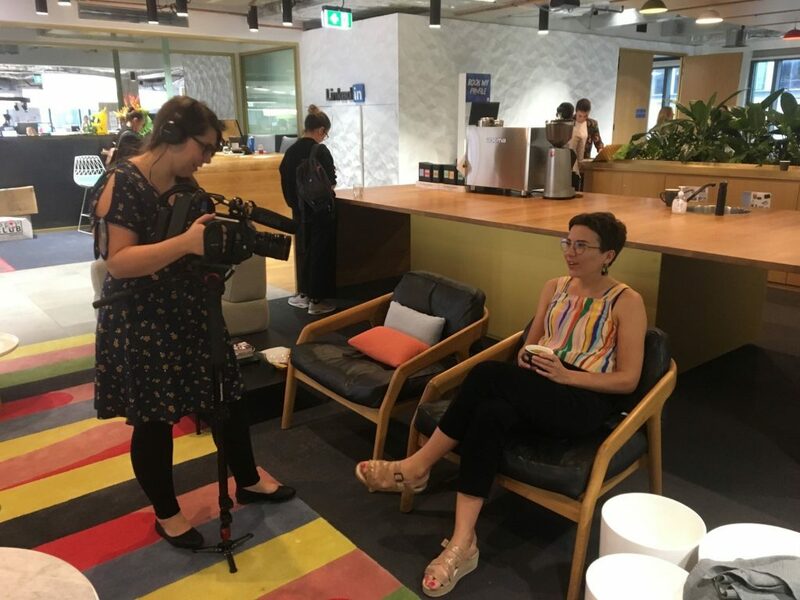 Last week, SheStarts launched the long-awaited second Documentary Series about emerging female founders of global tech companies. It shows the founders’ progress through the SheStarts six-month accelerator powered by BlueChilli, growing their startups from ‘napkin ideas’ to companies ready to take on the world. Starting a business is a high stakes game. It’s said that over 90% of startups fail. But starting your business with the whole world watching? That’s just plain terrifying. I would know, because I am one of the four female founders featured in the SheStarts documentary. In March 2018, I quit my job as a youth advocacy adviser for a global child rights NGO, to start my own tech company. I had no tech skills, I didn’t understand startups, and my company is doing something no one has ever done before. There was no roadmap for what would happen. To add a little more to the stress, I had to live in my van for the majority of the accelerator. Life had never been more chaotic. The documentary somewhat romanticised this experience: “I had to make some lifestyle choices. I’m living in my van,” my voice is heard to be saying as I drive through sweeping landscapes and cook myself dinner by a creek. The reality was that things were extremely stressful at that point in my life: I had no idea if my business would succeed or where I would get my next paycheck…or shower, for that matter. To top it off, everything I did was being filmed, so if I stuffed up, everyone would know. Zoë being interviewed and filmed by the producer of the series, Rachel Storey. Despite this, I made time for the documentary, because I, like SheStarts, believe in the power of female storytelling. I believe you can’t be it if you can’t see it. And I know there are not enough visible women in business and in technology. SheStarts and their partners are making these stories visible. It’s not an easy road to start a startup: all of us made sacrifices. It’s important for people to see those sacrifices but also see that it is possible to be a young woman starting a global tech company. I never thought I would become a startup founder, because I didn’t see any other young, van-living, birkenstock-wearing women doing that! In the same way, I never thought I would find myself in an abusive relationship because I hadn’t heard of any young, educated, confident, worldy, successful women experiencing that. But I am a startup founder, and I am a survivor of violence. I am proud of being both of these things: these are the stories I am telling in this documentary. Filming the documentary series pushed us because we were at an extremely vulnerable time in our lives. We were putting our hearts on the line, declaring our dreams, saying: I can do this! This is my time! This is a bold thing for a woman to do under any condition. 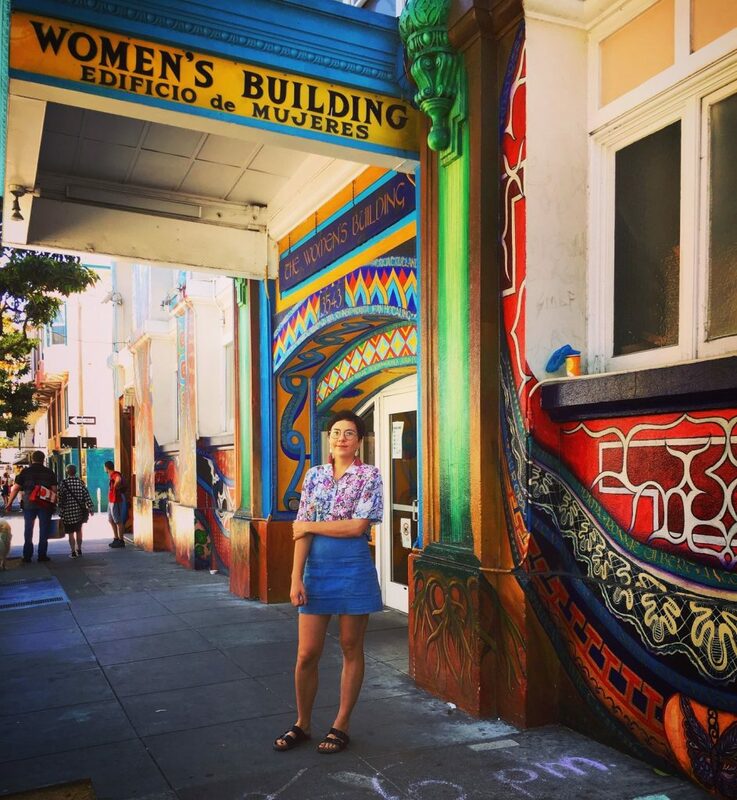 Zoë under the Women’s Building in San Francisco. To declare myself ready, competent and able to run a global tech company is heart-stoppingly scary thing to do. My company is so deeply close to my heart that I feel a personal responsibility to address gender-based violence and to do it thoughtfully. Starting She’s A Crowd made me feel vulnerable because once and for all, the buck stopped with me. That meant that every criticism, every question weighed on me. It meant that filming at a time like this required a lot of trust in the filmmakers at The Story Boxes, and a lot of trust in the world to see the best in us. It’s an experience that I welcomed wholeheartedly because I believe in the power of stories and the power of vulnerability. When women share our stories of gender-based violence and sexual assault, we too become extremely vulnerable. This is because we are often not taken seriously. This is because we have often had experiences that led us to mistrust the world. This is because, for many women, our ethnicity, age, ability, sexuality, gender identity, occupation or previous behaviour means that we will be blamed for the incident, rather than believed. This is something I had personal experience with. And it’s what my company, She’s A Crowd, is addressing. So I’m proud to share my story – the good, the bad and the ugly, with the world. There is no point hiding, or trying to appear perfect, when being vulnerable gives other women the strength to take risks, dream huge and be bold. And that’s what I’m all about.